ProVu Communications - August Newsletter 2009. Snom Tip - Lost Your iPod or iPhone Mains Charger? Use a Snom 820! ProVu and Snom invite you to meet with us at Call Centre & Customer Management Expo Exhibition 2009. Showcasing our ProTalk High Availability Systems, together with QueueMetrics Call Centre Package and the range of Snom VoIP Phones. Also including features: Customised Call Statistics, Retrospective Call Recording and Hot Desking. If you are planning to stop by and see us, please contact us to arrange a meeting time. If you are interested in deploying Snom OCS Edition phones, please contact us to discuss the special firmware release. ProVu have been appointed by Yealink as their specialist IP distributor for the UK. Now in stock, available for next working day delivery. For the month of August, ProVu are offering a limited amount of units from the Yealink VoIP Range to our resellers on a '14 Day Sale or Return' basis. This is a great opportunity to purchase a Yealink product for evaluation purposes, to assess suitability for your use and for your customers. If you do not currently have a username and password to access this information, please contact us and we will be happy to supply you with one. For ProSys customers, product part codes are now live enabling you to place orders on line. For the month of August 2009, ProVu are running a 'Cisco Small Business Summer Offer' for a select number of the Linksys SPA VoIP Phones. While stocks last! All phones are latest UK specification and are supplied with normal warranty terms. Linksys SPA-921 - £10 OFF! Linksys SPA-941 - £10 OFF! Linksys SPA-942 - £5 OFF! The promotional pricing, along with stock status is available to view on our Online Trade Price List. ProSys customers are able to place orders as normal and benefit from this pricing. Let us know how we can help you further! This is your opportunity to voice your opinion and let us have your ideas and feedback on how we can help you. Here are a few of our brain waves - shout out which is your favourite and would be most beneficial to you as a ProVu customer. On ProVu's Snom Training Days, we always endeavour to make time for a little experimentation. During our last session in July, one of our very clever attendees discovered that he could use the USB port in the back of his Snom 820 to charge up his iPhone! So if your mp3 player or phone dies at work and you haven't got your mains charger with you, or if you're a scatterbrain and have misplaced it - the Snom 820 can step in and save the day! Simply pop your iPod or iPhone USB lead into the USB port on the back of the Snom 820 and connect your phone to charge up your battery. Check out the picture taken on our July Snom Training Day to see how it's done! Get the best solution for your money. With full interoperability in the range, don't pay for features you simply won't use. Mix and match a combination of Siemens Gigaset IP DECT handsets and base station. 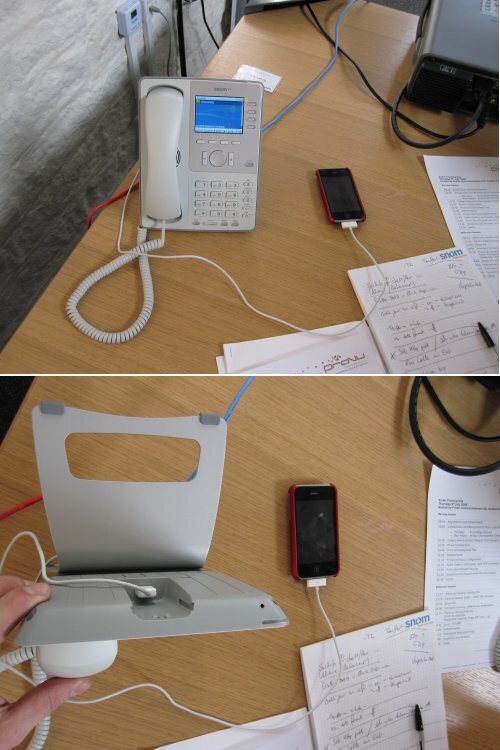 An A58H works great with a C475IP or S685IP base station, giving you a cheaper handset with voicemail. Alternatively register a C47H or S68H with an A580IP. Getting a posh handset with colour screen and bluetooth (S68H) and a cheaper base station without the voicemail. All three basestations allow any combination of up to 6 handsets to be registered, and 3 concurrent calls. (Two VoIP, one PSTN).